This morning in Huntington at 6:40AM it’s currently 29 degrees under overcast skies. Winds are calm. Relative humidity is 89%, dewpoint 26, barometric pressure 29.99” and rising rapidly. We picked up 0.13” of rain in the past 24hrs. Snowpack is a firm 17”. Yesterday’s high was 41, and the overnight low was 29. Low pressure is currently moving eastward off the coast, and high pressure will build into the region bringing us a string of dry and seasonable days through the upcoming week. We’ll see cloudy skies today with highs in the upper 30s and north winds 10 to 15 mph gusting up to 30 mph. Tonight should be partly cloudy until midnight, becoming clear. Lows will be around 19 with north winds 10 to 15 mph gusting up to 25 mph until midnight, and becoming light and variable. Tuesday should be sunny with highs in the lower 40s and light and variable winds. Tuesday night should be partly cloudy with lows in the mid 20s and southeast winds around 10 mph. Wednesday’s looking partly sunny with highs in the mid 40s and southwest winds around 10 mph. Wednesday night should be mostly clear with lows in the mid 20s. Last year on this date we had a high of 54 and a low of 24. The Moon is a waxing crescent, 16 hours old with 1% illumination. After what seemed like months of silence buried under ice and snow, Fargo Brook has found its voice once again. 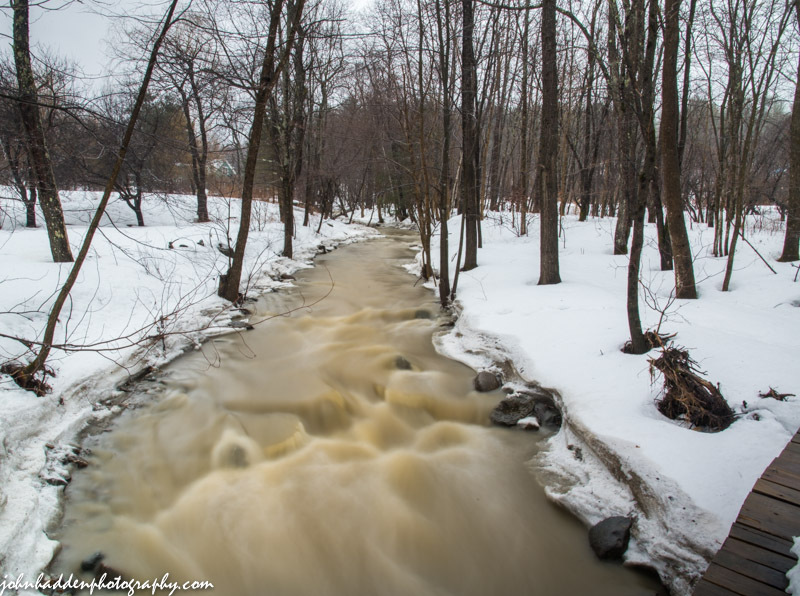 After Saturday’s rains, the ice finally went out on the brook, and the water ran muddy. It’s good to hear it once again! Nikon D600, Nikon 24-120mm lens @ 24mm, variable ND filter, ISO 100, f/22, 5″ exposure. This morning in Huntington at 7:05AM it’s currently 35 degrees and raining lightly under overcast skies. Winds are out of the west at 0-3 mph. Relative humidity is 95%, dewpoint 33, barometric pressure 29.80” and falling. We picked up 0.86” of rain overnight with a touch of sleet. Snowpack is down to 18”. Yesterday’s high was 45, and the overnight low was 34. A complex low pressure system will continue to bring mixed precipitation to the region this morning, and will taper off to drizzle and freezing drizzle this afternoon. We’ll see mostly rain this morning with some drizzle and freezing drizzle likely with ice accumulations around a trace. Highs will be in the mid 30s with north winds 10 to 15 mph. Chance of precipitation is near 100%. Tonight should be cloudy with a chance of drizzle or freezing drizzle until midnight. Lows will be in the upper 20s with north winds 10 to 15 mph. Monday should starry out mostly cloudy in the morning, then become partly sunny as high pressure begins to build in. Highs will be in the upper 30s with north winds 10 to 15 mph gusting up to 30 mph. Monday night should be partly cloudy with lows in the lower 20s and north winds 10 to 15 mph gusting up to 25 mph. Tuesday’s looking mostly sunny and seasonable with highs in the lower 40s and light and variable winds. Tuesday night should be partly cloudy with a chance of rain or snow showers as a mid-level low skirts to our north. Lows will be in the lower 30s. Chance of precipitation is 30%. Last year on this date we had a high of 50 and a low of 25. We picked up 0.01″ of rain, and our snowpack was gone. The Moon is new, 29d 3h old with 0% illumination. It seems like a long time since we’ve had rain given the unusually cold March we’ve just experienced. Despite my love of skiing and avid use of all the snow we’ve had on the ground, I have to admit that I’m happy to see spring begin to finally exert itself a bit! Next stop, Mud Season! This morning in Huntington at 7:00AM it’s currently 35 degrees under overcast skies. Winds are calm. Relative humidity is 96%, dewpoint 34, barometric pressure 30.26” and rising rapidly. We picked up 0.20” of rain in the past 24hrs. Snowpack is down to 21” at the stake. Yesterday’s high was 45, and the overnight low was 34. There is a Winter Weather Advisory in effect for our region from 8:00PM tonight until 2:00PM Sunday. A flood watch is in effect for southern Vermont and areas south. We’ll have generally quiet conditions for much of today before a moisture laden coastal storm system impacts our region tonight into Sunday. We’ll see partly sunny skies with a slight chance of rain, snow and sleet this afternoon. Highs will be around 40 with north winds around 10 mph this morning, becoming light and variable. Chance of precipitation today is 20%. Tonight will bring a slight chance of rain until midnight, then snow and sleet arrives in earnest as the storm pulls in. We may see snow and sleet accumulation of 2 to 4 inches overnight. Lows will be in the lower 30s with light and variable winds, becoming northeasterly around 10 mph after midnight. Chance of precipitation is near 100%. Snow, sleet and freezing rain will continue into Sunday morning, transitioning to all rain by midday. We should see total snow/sleet accumulations of 3 to 5 inches with ice accumulations of up to a tenth of an inch. Highs will be in the upper 30s with northeast winds 10 to 15 mph. Chance of precipitation is near 100%. Sunday night should be mostly cloudy with a chance of freezing rain and freezing drizzle. Lows will be in the upper 20s with north winds 10 to 15 mph. Chance of precipitation is 50%. Last year on this date we had a high of 47 and a low of 34. 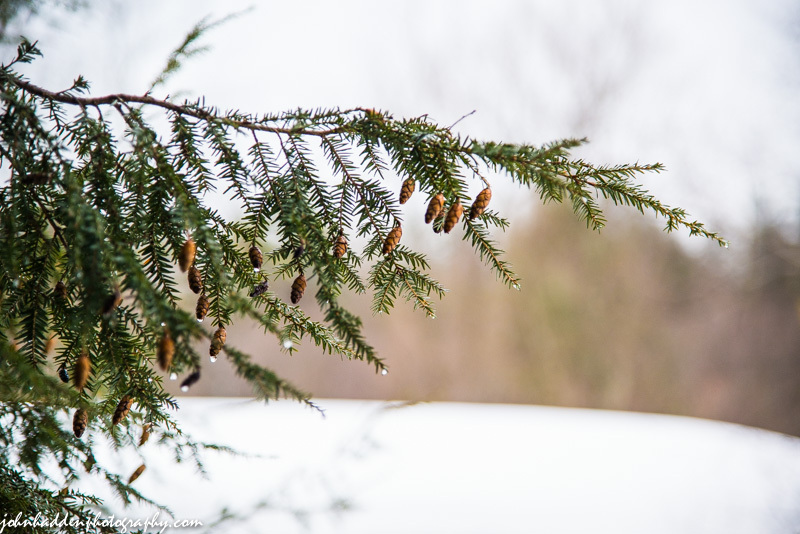 We picked up 0.02″ of rain and had 5″ of snow on the ground. This morning in Huntington at 6:40AM it’s currently 35 degrees under overcast skies. Winds are out of the south at 3-5 mph. Relative humidity is 81%, dewpoint 30, barometric pressure 30.01” and falling. We picked up 0.75” of new snow and have 23” on the ground. Yesterday’s high was 36, and the overnight low was 31. There is a Winter Weather Advisory in effect for our region until noon today, and a Winter Storm Watch in effect for the region for Saturday evening until Sunday afternoon. Low pressure moving through the Great Lakes will continue to bring a wintry mix of precipitation to the region this morning before changing over to rain by mid-day. Rain will taper off to scattered rain and snow showers this evening before ending by midnight as high pressure returns through the first half of Saturday. We’ll see rain or sleet this morning, then rain this afternoon. Highs will be in the mid 40s with south winds 15 to 20 mph gusting up to 30 mph. Chance of precipitation is near 100%. Tonight should be cloudy with rain likely until midnight, then become partly cloudy with a chance of rain showers after midnight. Lows will be in the lower 30s with southwest winds 10 to 15 mph gusting up to 30 mph and becoming westerly after midnight. Chance of rain is 60%. Saturday will start out partly sunny with a slight chance of rain in the afternoon. Highs will be in the upper 30s with north winds around 10 mph in the morning, becoming light and variable. Chance of rain is 20%. A storm system moving up the East Coast will bring a return of mixed precipitation Saturday night into Sunday morning. We’ll see snow, sleet or rain overnight with moderate snow accumulations possible. Forecast models are a little on the fence for how much cold air will be in place in our immediate area, so we may see heavy snow or sleet or just rain. There is a lot of moisture in this system, however, so whichever way it goes, we’ll notice it! Overnight lows will be around 30 with northeast winds around 10 mph. Chance of precipitation near 100 percent. Precipitation will continue into Sunday with additional moderate accumulations. Highs will be in the upper 30s with north winds around 10 mph. Chance of precipitation is 80%. Sunday night should be partly cloudy with lows in the mid 20s. Last year on this date we had a high of 46 and a low of 32. We picked up 0.01″ of rain and 0.75″ of snow and had 2.75″ of snow on the ground. Record low was -5°F in 1923. The Moon is a waning crescent, 27d 3h old with 7% illumination. 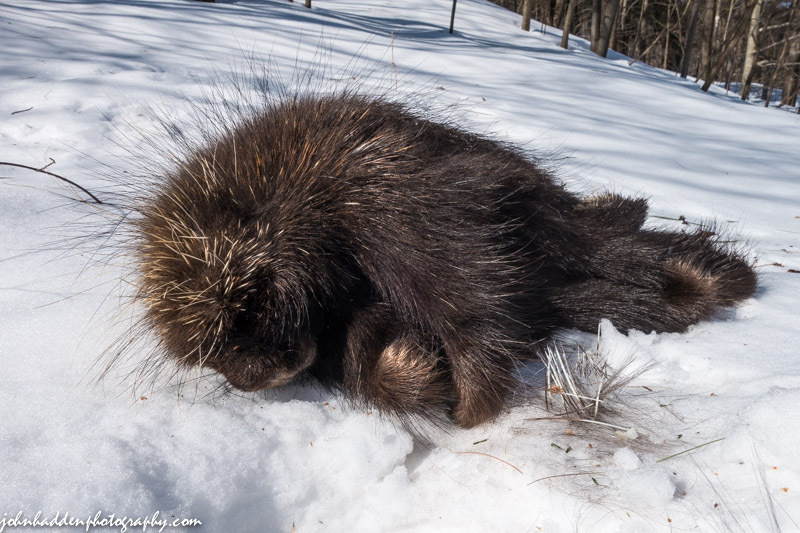 I came across this dead porcupine while skiing at Sleepy Hollow the other day. I didn’t have my camera with me (dummy…) so went back to the spot yesterday to get a shot. It’s a bit of mystery as to how the critter died. There were signs of a scuffle, but no obvious predator tracks in the area. This morning in Huntington at 8:30AM it’s currently 11 degrees under clear skies. Winds are calm. Relative humidity is 75%, dewpoint 4, barometric pressure 30.32″ and rising slowly. Snowpack is hanging in at 23″. Yesterday’s high was 26, and the overnight low was 1. High pressure over the region this morning will give way to an approaching low from the west this afternoon which will bring mixed precipitation to the area late tonight through Friday. We’ll see mostly sunny skies this morning, then mostly cloudy skies this afternoon. Highs will be in the lower 30s with light and variable winds, becoming southwesterly around 10 mph this afternoon. Tonight should be cloudy with snow likely mainly after midnight. We could see snow accumulations of a dusting to 1 inch by morning. Lows will be in the upper 20s with south winds 10 to 15 mph. Chance of snow is 70%. Precipitation will continue into Friday morning with sleet, freezing rain or rain transitioning over to all rain in the afternoon. We could see sleet accumulations a dusting to 1 inch and ice accumulations of up to a tenth of an inch, especially over higher terrain, so the morning commute might be a little tricky. Daytime highs will make it into the mid 40s with south winds 15 to 20 mph gusting up to 35 mph. Chance of precipitation is near 100%. Friday night should be mostly cloudy with a 50% chance of rain showers. Lows will be in the upper 20s with west winds 15 to 20 mph gusting up to 30 mph. Saturday should bring a break in the action with partly sunny skies behind the departing low. Highs will be in the upper 30s with light and variable winds. A coastal low will approach Saturday night bringing cloudy skies with a chance of snow or rain. Lows will be in the mid 20s. Chance of precipitation is 50%. At this point, it’s looking like the unseasonable cold may be behind us, as milder weather looks to be in store for next week. Last year on this date we had a high of 45 and a low of 27. We had 2.75″ of snow on the ground. The Moon is a waning crescent, 26d 4h old with 14% illumination. 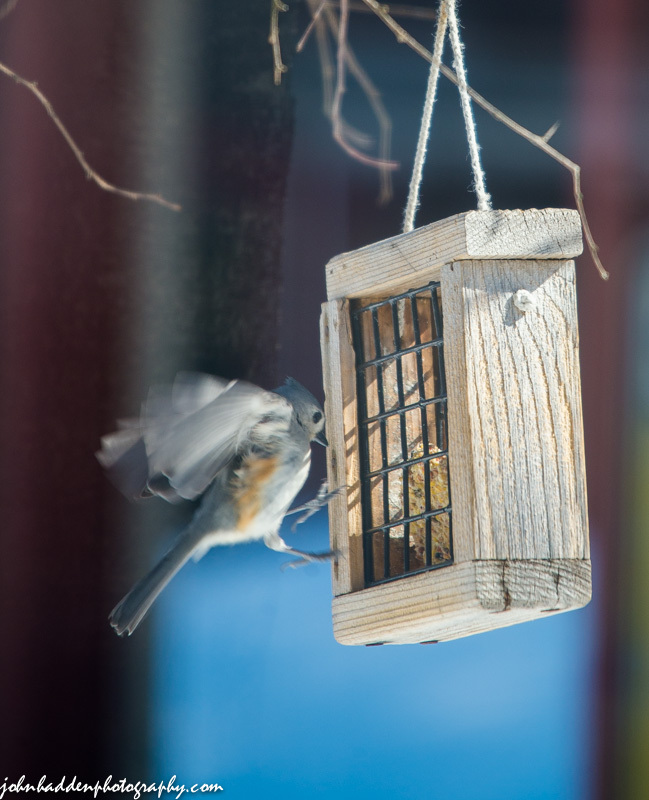 The shy tufted titmouse is a regular at our suet feeder. For such a diminutive little bird, the males have a lovely spring song. This morning in Huntington at 6:40AM it’s currently 18 degrees under overcast skies. Winds are out of the west at 0-3 mph. Relative humidity is 81%, dewpoint 13, barometric pressure 29.92” and rising slowly. Snowpack is hanging in at 23”. Yesterday’s high was 33, and the overnight low was 14. As a strengthening low pressure system passes east of Cape Cod today, gusty northwest winds will develop this afternoon and continue through this evening. A weak upper level trough of low pressure will move across the area today trigging a few scattered snow showers. We’ll see mostly cloudy skies this morning, then partly sunny skies later. There’s a 20% chance of snow showers. It’ll be on the cool side with with highs in the mid 20s and northwest winds 15 to 25 mph gusting up to 35 mph. Tonight should be clear and cold with lows around 4 above and northwest winds 15 to 25 mph, diminishing to 10 to 15 mph after midnight. Thursday should be partly sunny and milder with highs in the lower 30s and west winds around 10 mph, becoming southerly in the afternoon. An upper level trough will approach the region Thursday night bringing sleet or snow overnight that will transition to rain by daybreak. Expect little or no snow accumulation. Lows will be in the upper 20s with south winds 10 to 15 mph gusting up to 30 mph. Chance of precipitation is 70%. Friday will bring rain or sleet in the morning transitioning to all rain. Highs will be in the lower 40s with south winds 15 to 20 mph. Chance of precipitation is 80%. Rain will continue into Friday night with lows in the lower 30s. Chance of rain is 80%. We’re on track for more seasonable temperatures through the weekend and into next week. Last year on this date we had a high of 43 and a low of 28. We had 3″ of snow on the ground. Record low was -4°F in 1960. The Moon is a waning crescent, 25d 2h old with 24% illumination. Sign of spring! 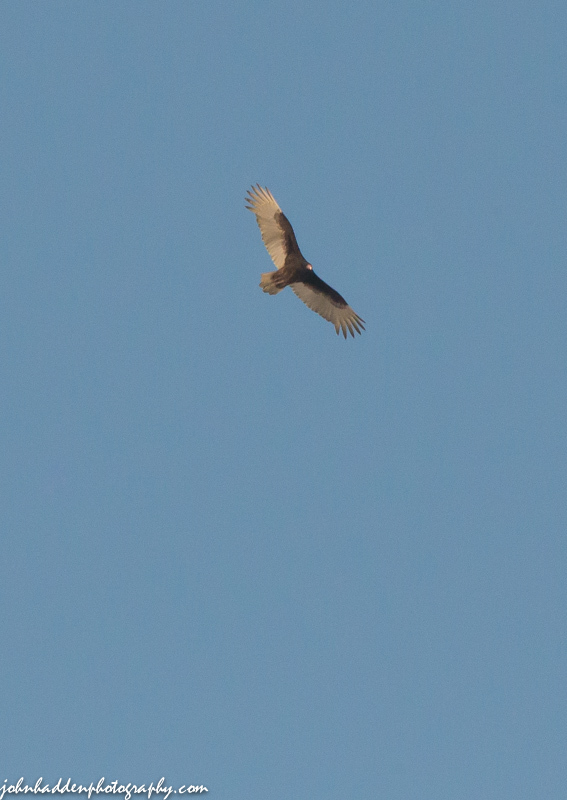 I spotted this turkey vulture wheeling in the sky over a field in Charlotte yesterday afternoon. This morning in Huntington at 7:00AM it’s currently 8 degrees under partly cloudy skies. Winds are calm. Relative humidity is 86%, dewpoint 5, barometric pressure 30.09”. Snowpack is 23”. Yesterday’s high was 26, and the overnight low was 0. Relatively dry weather is expected today with a continuation of below normal temperatures courtesy of high pressure currently moving east of the region this morning. The unseasonable temperatures will remain through Wednesday when an upper level trough of low pressure will move in from the west and bring a chance of light snow to the area. We’ll see mostly sunny skies today with highs in the upper 20s and south winds around 10 mph gusting up to 25 mph this afternoon. Tonight should be partly cloudy until midnight, then become mostly cloudy. Lows will be around 15 with south winds around 10 mph until midnight, becoming light and variable. Wednesday should be cloudy with a chance of light snow mainly in the afternoon as the aforementioned trough moves through. Highs will be in the upper 20s with north winds 15 to 20 mph gusting up to 35 mph in the afternoon. Chance of snow is 40%. Wednesday night should be partly cloudy and cold with lows zero to 6 above zero and northwest winds 15 to 20 mph gusting up to 35 mph. Thursday’s looking partly sunny and more seasonable with highs in the lower 30s and west winds around 10 mph with gusts up to 25 mph. Low pressure will approach the region Thursday night bringing the chance of overnight snow that will transition to rain by Friday morning. Lows will bottom out in the upper 20s before rising towards daybreak. Chance of snow is 60%, but expect little accumulation. Last year on this date we had a high of 46 and a low of 15. 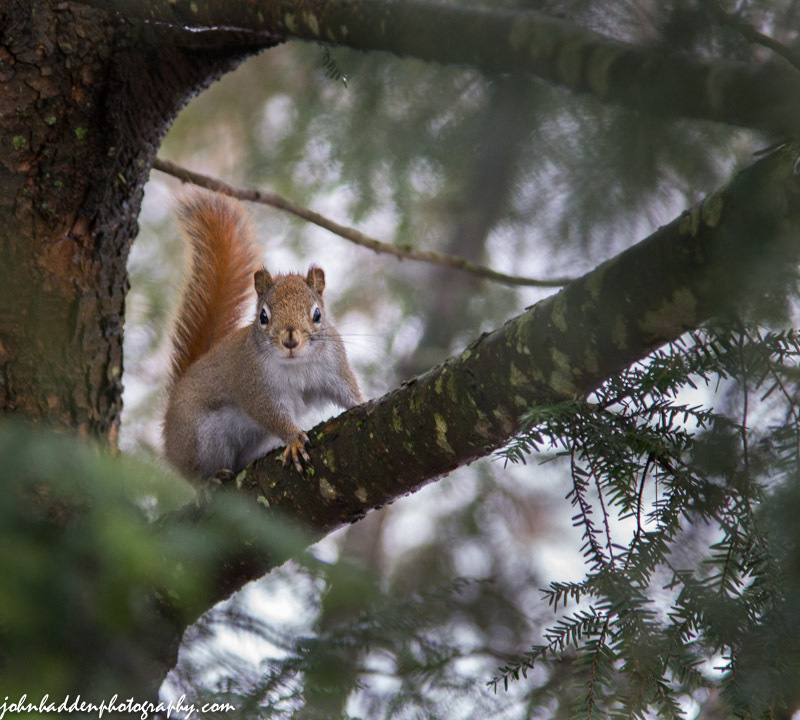 We had 5″ of snow on the ground. The Moon is a waning crescent, 24d 3h old with 34% illumination. We were on our way to a friend’s house Saturday evening when we had to stop and take a shot of this lovely scene above the Taft farm. 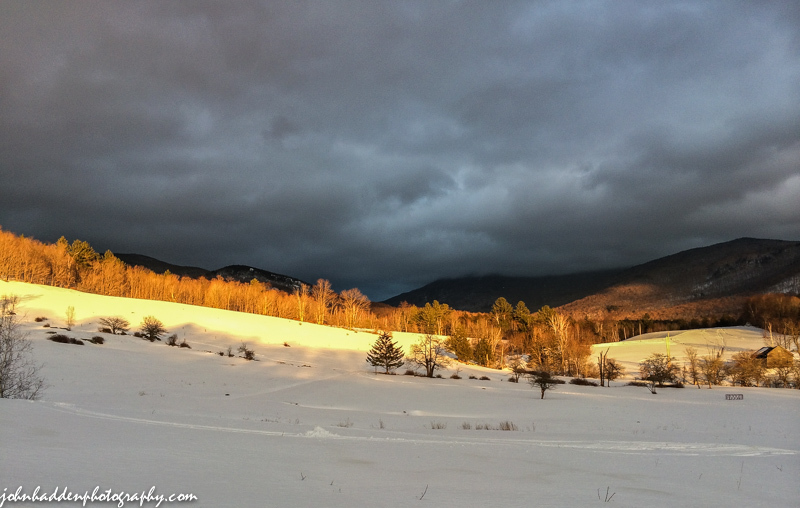 The contrast of the brilliant sunlit trees and snow and the brooding clouds and mountains was riveting. Having forgot any of my “real” cameras, I took this shot with my iPhone.